Google what? Is Google entering the automobile market as well? We’ve all heard about the Google Car, yes? But this is not about that. In fact, you’re probably already shaking your head at my poor attempt at a joke, and I don’t blame you! Seriously, though, Google Drive is the cloud service offering of the tech giant, and it is making waves out there. If you’re already hooked on the cloud, then you might even be a Google customer for this service at this point. If not, and you are still weighing your options for a cloud service provider, here is a great infographic which might help you. 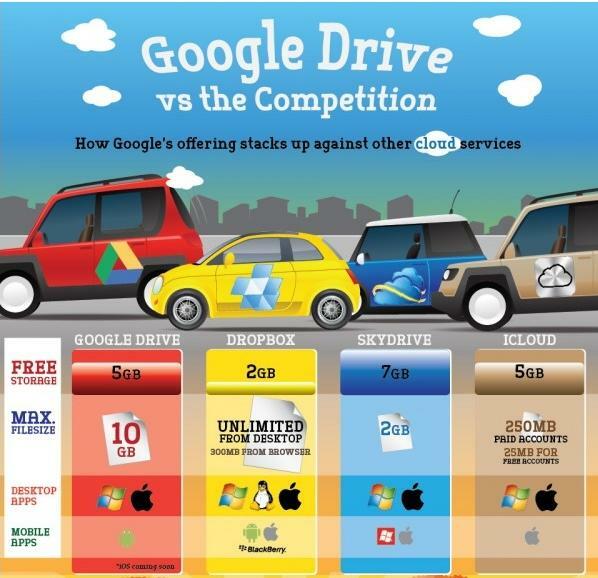 The focus is on Google Drive, but it does compare Google’s cloud service to its competitors, namely Dropbox, Skydrive, and iCloud. With regard to free storage, Google Drive does pretty well with 5GB. Only Skydrive beats it with 7GB. As for file size, Google Drive beats everyone with a 10GB limit. Of course, there is the premium service that many people are willing to pay for. While Google Drive does not have the cheapest option, it does offer competitive prices. Go analyze the comparisons yourself. Here is the infographic. Hopefully, it will help you make the right decision. Grace Patterson is an infographic design enthusiast who likes sharing her finds online. She is also an avid user of online data storage services.